‘You want to be American’! La città più bella del mondo! Video via XDrone Nicola Capuozzo. Music: Luciano Pavarotti Core ‘ngrato. For my birthday, a friend kindly gave me a CD of Neapolitan classics, sung in the local language by the incomparable Roberto Murolo, a Naples legend whose velvety voice interpreted the songs of his homeland after WW2 until his death 10 years ago. This one, Scalinatella, tells of a small staircase leading down to the water at Posilippo where a man wistfully waits for his girl, who has fallen in love with a man from Capri and who will shortly leave him, down the stairs and then away by sea. Featured Image (one of many beautiful Naples scenes) by Claudio Morabito via Flickr. Just along the coast from Naples there is the little fishing hamlet of Marechiaro, reached by a narrow twisty lane that descends from Via Posillipo. It’s wildly popular at the weekend with sunbathers, swimmers and boaters due to the clean water, the panoramic views over the Bay of Naples, and the cluster of seafood restaurants along the shore. It’s also famous for the classic Neapolitan song A Marechiaro which tells of a window in the village, marked with a carnation, at which Caroline appears to be serenaded by a young fisherman-in-love. 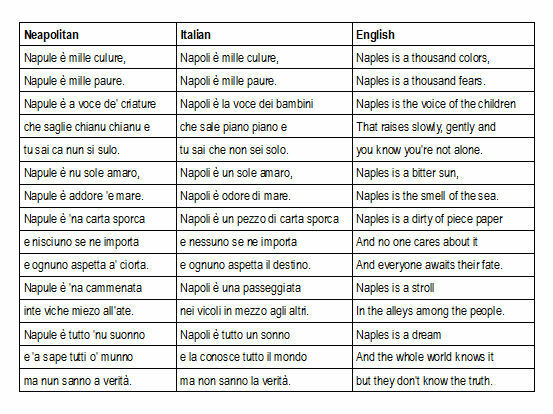 The song is sung here by Roberto Murolo, son of the city, classic interpreter of Naples songs with a wonderful voice.